B-Movie TV is a fun site that features clips from old, silly American commercials and films that are overdubbed in another language. 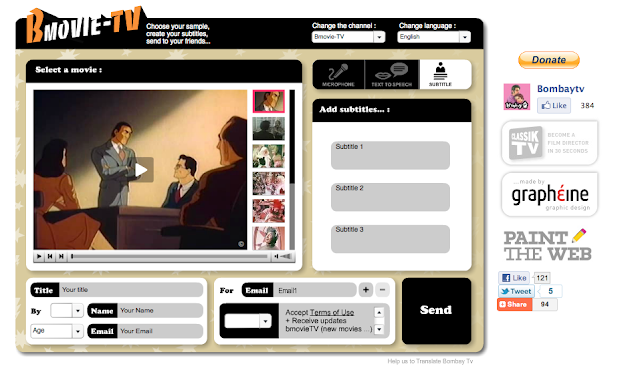 You can type in subtitles narrating or dialoging the scene, and can also choose to use text-to-speech or record over the clip. For more fun, you can switch to Bombay TV (see "switch channels") and do the same with Bollywood movies, which, not to be culturally insensitive, are notoriously over-the-top in terms of costumes, plotlines, and even frequent choreography. -B-Movie TV is an engaging way to explore inferential thinking, story grammar and exposition (for the ads), humor and interpretation of body language when you are choosing a clip with your students and mapping out the "plot." -The opportunity to write or record the language for the track can target vocabulary, sentence formulation or speech production strategies. This site is Flash-based and therefore is NOT iPad-friendly. Thank you to Larry Ferlazzo for featuring this website. Amazing site !, truly appreciate your find.